Set the stage for summertime home selling by creating an environment where potential buyers can see themselves relaxing and entertaining in a cool, comfortable space. Turn the patio into an additional “room,” complete with table, chairs, placemats, plates, and cloth napkins. Add a new outdoor rug and cushy pillows to furniture. Set the stage inside for summer living and activities, as well. Add a basket of pool towels and sunscreen in the laundry room. Use sea shells, lightweight fabrics, and woven accents to create a “beachy” feel. Add lots of fresh flowers. Splurge on air-conditioning. Turn on ceiling fans (low setting, though–don’t blast visitors out of the house). Hot, stuffy rooms make potential buyers want to leave. Keep them comfortable so they’ll stick around and check out the rest of the home! Open curtains and blinds before every showing to lighten and brighten your living spaces with summer sunshine. Avoid using the oven before a showing. No need to add extra heat during the summer months. Set out a decorative container filled with ice and bottles of cold water for potential buyers (give your agent a heads-up that you’ll be doing this). Everyone appreciates a cold drink in the heat. Amp up curb appeal to make buyers want to get out of the car and come in. Keep the lawn green and trim. Plant beautiful flowers. Weed beds and add plenty of new mulch. Power-wash sidewalks, driveways, porches and decks. Ready to stage your home for a summer sale? 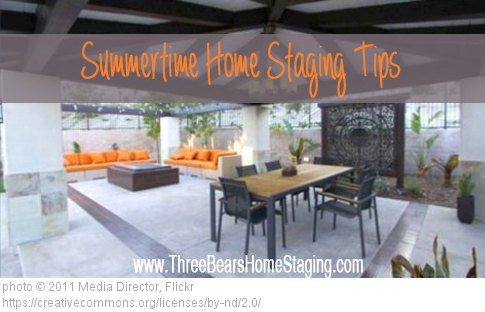 Give Three Bears Home Staging & Redesign a call at (832) 377-0785 to get started today! This entry was posted in Curb Appeal, Selling, Staging and tagged home selling summer, home staging for summer, katy tx home staging, summertime home staging. Bookmark the permalink.